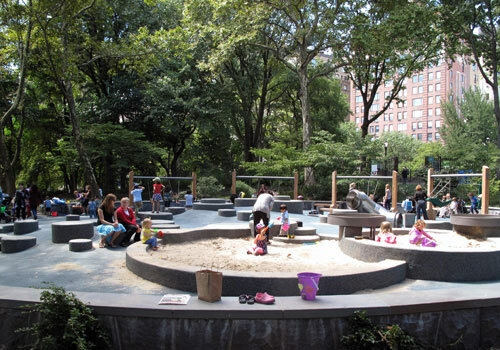 Completely rebuilt as part of the Central Park Conservancy's Plan for Play initiative, Tarr-Coyne Tots Playground features play equipment designed for the Park's youngest visitors. The new playground includes a sprinkler for the very first time, two sandboxes and elevated sand tables, swings, and land forms. The land forms provide the youngest users with many opportunities for crawling, climbing, and exploration.